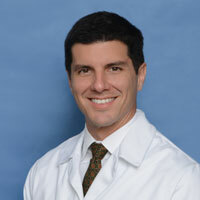 Dr. Manuel Eskildsen is a board-certified physician and a clinician-educator in the Division of Geriatrics at UCLA. He completed his internal medicine residency training at the Cambridge Health Alliance and Harvard Medical School in Cambridge, MA. He completed a fellowship in geriatric medicine at the Beth Israel Deaconess Medical Center and Harvard Medical School in Boston, MA. He has practiced at both the Cambridge Health Alliance and the Emory University School of Medicine in Atlanta after finishing his training, and has clinical experience in various settings of care, including the hospital, skilled nursing and rehab facilities, and the home. At UCLA Geriatrics, he is part of the skilled nursing facility practice group, caring for patients at the Brentwood Health Care and Berkley West facilities. He is medical director at Brentwood Health Care.